I am Sailing….I am sailing, home again ‘cross the sea….I am sailing…. 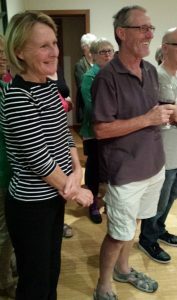 KK (Kokoda Kerrie) and Johnno were sent off by Y Striders at a ‘low quay’ function on Sunday night. As they set sail on their yacht we wish them goodbye, good fortune, good weather and happy sailing. Come back soon KK, we miss you already! !